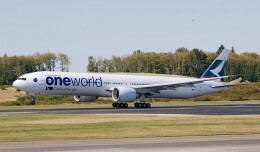 Cathay Pacific Airways today took delivery of their 12th Boeing 777-300ER, which sports a special OneWorld alliance livery. "Name's Turkish. Funny name for an Irishman, I know." KLM took delivery of their latest 777-300ER today, painted in the special 10th anniversary SkyTeam livery a number of carriers have adopted in recent months. A Korean Air 777-300ER suffered a tail strike while landing at Tokyo Narita Airport in high winds.